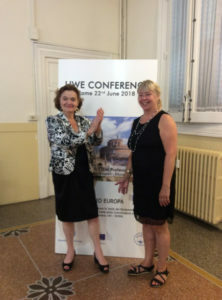 From 21st until 26th June 2018 UWE members from many European countries, including Italy and some representatives from Israeli and Lebanese delegation, met in Rome for the conference and UWE AGM 2018. 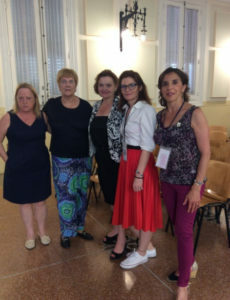 Consideration and reflection of single participants have shown a great appreciation and recognition for the serious and professional efforts undertaken by the FILDIS organizers Gabriella Anselmi-President and Pina Foti also UWE board. Special thanks to Edith Lommerse, the UWE President, who actively supported and cooperated for the purpose of this event. 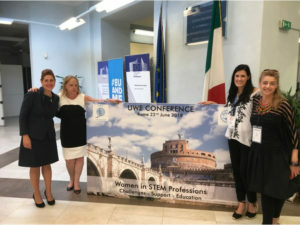 The great satisfaction, the pride and the boldness shown in the excellent results of all the events related to UWE ROME CONFERENCE, particularly “Women in STEM professions: Challenges – Support – Education”. 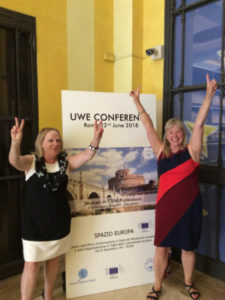 For all the participants, a shared heritage to report and reflect into the local realities in order to confirm how UWE can be a valid point of reference to successful initiatives aimed at promoting improvement and up to date status of European women’s professional skills. Key note speakers, excellent women in STEM professions were sharing the positive steps and highlighting the challenges on this important topic .In the afternoon three young women coordinated the workshop talking their experience in day to day life during their career development. The background of workshop leaders ranged from engineering to singing careers. There was much participation from the audience, including Britain, Austria and Romania; the discussion was lively and stimulating to all participants. Very exhaustive paperwork, variable sized panels, feminine exhibition and simultaneous translation. There has certainly been no lack of “Bel Canto” and amazing landscapes of Saint Peter’s Cathedral illuminated Dome or the absolutely breathtaking view on the seductive Eternal City enjoyed on the Gala Dinner charming terrace. 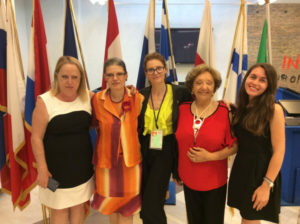 For the first time an award was established the “UWE Award 2018” which allow us to remember long and constructive project, on behalf of women, carried out by BFWG, one of UWE’s most long standing association . 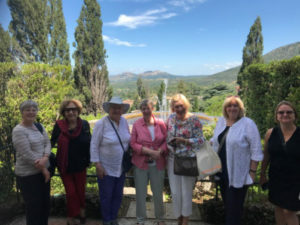 On Saturday 23 , we had our annual AGM, in the afternoon we had the election of the new UWE president Ms Anne Negre who’ll guide UWE for the next three years, UWE celebrated next year Centenary of GWI with typical Italian prosecco. Our new President Anne Negre gave a presentation and update about collective complaints and on the gender pay gap. The delegates voted for Anne Negre as UWE new President and also for Roxana Petrescu as UWE Secretary for three more years. Edith Lommerse gave a heartfelt final President’s report, summarizing her last six years. She talked about the highs more than the challenges, thanked the board and CER who supported her work during that period and became friends in the process, outlined her long term vision to UWE group, and promised to continue her support. Many CERs thanked Edith for her work, commitment and wished her all the best for the future. On Sunday 24th twenty UWE participants enjoyed a panoramic city tour and had a delicious fish lunch in a typical “Trattoria Romana”. 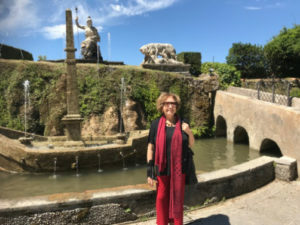 July the 25th and 26th have been devoted to three historical Tivoli’s villas: Villa Adriana, Villa Gregoriana and Villa D’Este, designated as UNESCO Cultural Heritage sites. Unforgettable trip, comfortable journey, four stars Hotel staying with external pool and SPA. 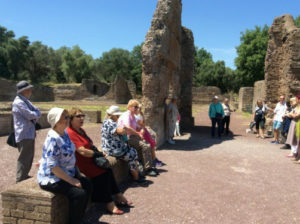 Villa Adriana (Hadrian’s Villa) is the archaeological symbol of Tivoli: the ancient residence of Emperor Hadrian, is still witness the magnificence of the ancient Roman Empire. Villa D’ Este is the symbol of Italian Renaissance architecture. It is considered to be the moste beautiful Italian style garden of Europe. Villa Gregoriana is the landscaping postcard of Tivoli, a peaceful green park and characterized by forests, caves, hiking trails and gorgeous waterfall.